Below is listing and video experiences of Africa's top touring destinations and individual trip reasons on why you should visit it based on your preference. 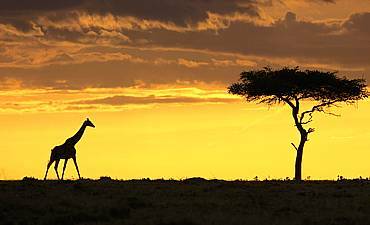 For Tour Planning Guidance On Africa, Please Contact Us. The continent of Africa has been touched by cultures from around the world, and South Africa is one of the few places on Earth where you have a truly wholesome experience. The country excels as a modern destination while sustaining the wilderness experience of Africa’s pristine outback, from Kruger, Sabi Sand, Madikwe to Phinda and Shamwari. South Africa offers striking landscapes and wildlife that engages the minds of photographers and conservation enthusiasts around the world. With an infrastructure that rivals even the most cultured European locations, you are assured the conveniences and utmost service that is expected from a thriving and diversified economy. Cape Town and Johannesburg are international tourist centers, and South Africa often hosts some of the world’s most significant international events, such as the Rugby World Cup, Indian Cricket Premier League and Soccer World Cup. As a discerning South African traveler, you enjoy the many benefits of the country, including developed logistics, accommodation, security and service levels. These qualities allow you to immerse yourself in heavenly gastronomic tours, high-end fashions, stunning artwork and museum displays, divine shopping and much, much more. South Africa is also home to some of the best wineries in the world, and you can sample many local wines in the beautiful settings of Stellenbosch, Franschhoek and Paarl. Engage with locals during year-round festivals throughout the country, such as Pick-n-Pay Oyster and Wine Mardi Gras, Oyster Festival in Knysna, Taste of Joburg and Franschhoek Bastille Festival. Even our adventurous outdoors guests find plenty to occupy their time with world-class golf, scuba diving, shark dives, hiking, biking and bungee jumping. In South Africa, food is less about consumption and more about savoring delectable morsels that awaken your every sense. The Michelin-rated and starred culinary establishments satisfy every palate in ways that you simply cannot imagine! Add to all of this, the gorgeous beaches of Camps Bay, Durban to Clifton, Sodwana, and you have the idyllic destination for solo travelers, couples, newlyweds, families and groups who desire a wonderful coastal metropolitan experience without being far from Africa’s wilderness country. Africa is a treasure trove of ecological gems, and Botswana is by far the shining star of the continent. Prized as the Jewel of the Kalahari, the Okavango Delta is an idyllic oasis that is teeming with diverse botanical and fauna species. In Botswana, you traverse on vehicle, foot, boats and mokoro amongst paths of wild date palms, mangroves, acacias and other flora that adorn the islands, channels and lagoons. 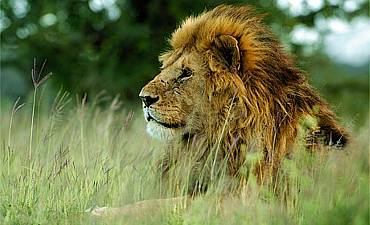 Amidst the vegetation are some of Africa’s most beloved creatures. 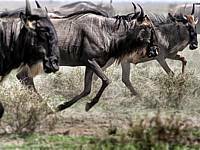 Buffalos, elephants, reedbucks, impalas, zebras, warthogs, hippos and other herbivores search for grasses, leaves and tender morsels. Camouflaged by the landscape and plant life are lions, leopards, wild dogs, cheetahs, hyenas and several other types of sly hunters. The air is filled with the songs and wingbeats of more than 500 bird species. Best of all, the spectacular setting attracts few visitors due to its high cost, making it a perfect destination for like-minded photographers, boutique guests and those who desire a more private African travel experience. Botswana is also one of the few outbacks in Africa where you can discover the natural beauty via water-based safaris. Professional guides skillfully navigate the waterways in traditional hand-carved canoes known as “mokoros”. After you spend time in the lagoons, floodplains and channels, partake of some terrestrial excursions, such as a rock art tour of Tsodilo Hills, a UNESCO World Cultural Heritage Site to see over 4,000 paintings by the ancient hunter-gatherer San Bushman. Chobe National Park is a distinct pachyderm destination that is known for viewing huge herds of elephants, and day trip takes you to the majestic Victoria Falls in Zambia and Zimbabwe. Linyanti, Selinda, Savute, Northern Tuli, Mashatu, Central Kalahari and other habitats are why Botswana is a favorite location for nature filmmakers, including Dereck and Beverly Joubert of the National Geographic. An array of safari activities and the second largest migration of zebras at Makgadikgadi as well as top-notch accommodations and highly personable service for your travel make Botswana a prime destination in Africa. 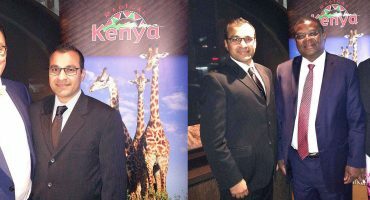 No matter how you define a breathtaking holiday in Africa, Kenya is a land where your every expectation is exceeded. From the sound of millions of wildebeest and zebra hooves thundering across open savannah plains of the Masai Mara to tranquil white sand beaches of Diani, Galu, Malindi and Watamu where palm trees sway in gentle ocean breezes, Kenya is a land of diversity and beauty. 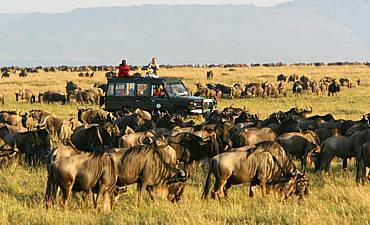 Watching the seasonal Great Migration is a spectacular Kenya safari experience for even the most discerning guest, and the abundance of resident wildlife is simply unimaginable. The animals and landscape are well-protected thanks to several neoteric land management efforts that demonstrate the optimum balance between human use and wildlife preservation. 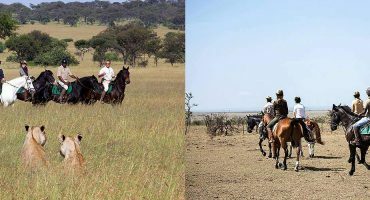 While the conservancies like Lewa in Laikipia are founded upon local conservation, the success has brought international attention and served as models for similar efforts around the world. Should you desire a more relaxed and rejuvenating setting, the Kenyan coastline offers pristine stretches of beach edged by the azure blue waters of the warm Indian Ocean. Spend hours wandering the coastline looking for natural gems nestled in tide-ebbing rock pools, or venture out into the water for scuba diving, snorkeling, sailing, deep sea fishing and much more. Seaside towns such as Shela in Lamu take you back in time to a simpler way of life, and in the remote outback, you interact with native peoples, from Maasai, Samburu to Swahilis who pleasantly share their traditions, artwork and beliefs. Many of the communities are supported by activities that both preserve the ecological treasures and provide improved quality of life. 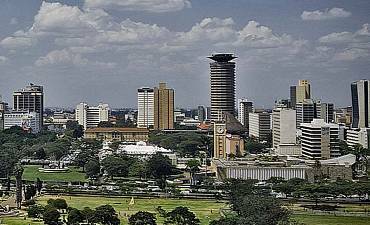 Kenya is also home to many intriguing historical sites such as Gede Ruins or Fort Jesus that demonstrate the longstanding history of both indigenous and international visitors that have contributed to the land of Kenya. One of the most well-known is the paleoanthropological site, Koobi Fora near Lake Turkana, a UNESCO World Heritage Site that is known as the “Cradle of Mankind”. The centerpiece of your dream travel in Tanzania is the experience. From the moment you first touch the native soil, you feel connected to land, animals and people unlike any others on the planet. As an immersion destination, Tanzania is a place where your imagination blends flawlessly with reality. Images that once remained frozen in nature magazines now stands majestically before your eyes. Tribal peoples like the hunter-gathering Hadzabe to the pastoralist Maasai that you first saw in heartfelt photographs now share your smile and greet you warmly. Vast landscapes that entice the human mind now stretch for miles inviting you to explore every tree, river, plain and mountain. These experiences await you in the land of Tanzania, one of East Africa’s most incredible destinations. A wilderness trip in Tanzania is where your heartbeat matches the rhythm of the Great Migration in Serengeti and Mount Kilimanjaro awakens the adventurer that lies asleep inside you. The country is an exceptional wilderness for guests who seek out places that are the off-the-beaten path, away from crowds, from the wildlife battling grounds of Katavi to chimp-habitat highlands of Gombe and Mahale. Places where you bring home untold stories with a renewed spirit and vigor. Tanzania is also one of the few places on earth where you can witness one of mankind’s closest primate relatives — chimpanzees that dwell within the secluded forests by Lake Tanganyika. The country offers a multi-faceted experience that expands beyond the remote outback. 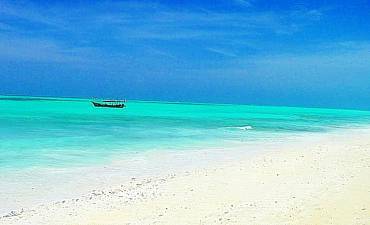 Just off the coastline sits Zanzibar Island, an archipelago that is rich in history, culture and all things exotic. Beyond the shoreline, the green-blue waters of the Indian Ocean entice you to delve into the bizarre and fascinating underwater realm of vivid corals and marine life in parks like Mnemba, Mafia and Chumbe. Creatures both great and small live an animated life that shares the predator and prey tale of terrestrial wildlife. “Mosi-Oa-Tunya” translation means “smoke that thunder,” the local description of Victoria Falls in Zambia. As one of the greatest natural wonders on the planet, the falls cascade 355 feet from a natural crevice in the Earth through which the Zambezi River travels. Over 38,000 cubic feet of water cascade down the falls every second, and the sight is simply mesmerizing. Even more intriguing for our guests are the subtle changes to the falls over the course of a year, primarily due to changes in rainfall. During the low waters, swim at the Devils Pool or dine at Livingstone Island, both sited at the lips of the falls. The wildness of Victoria Falls is an exceptional example of Zambia’s unspoiled, pristine outback country. Thanks in part to the country’s many waterways, the wilderness areas are abundant with diverse plants, trees, vegetation, wildlife and birds. Zambia’s national parks are precious natural resource that is prized amongst conservationists, and the Luangwa Valley and the namesake parks of South and North Luangwa are representatives of how proper land and wildlife management enhances the human experience. Known also as the “Garden of Eden,” the valley is a distinct safari destination, offering guests rare insights into animal behaviors. Impala frequently rut and calve in the valley, and the area has a high density of leopards. The habitats vary with the changing water levels, showcasing a natural cycle of dormancy and rebirth. 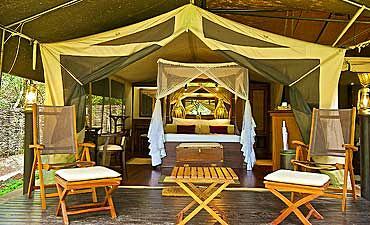 The safari activities are as diverse as the ecosystems. 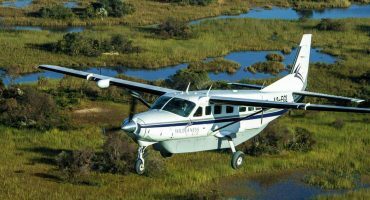 You may explore on foot during a walking safari, on a boat with a knowledgeable guide on a riverine birding safari at Lower Zambezi, explore the plains of Busanga in Kafue in a balloon safari or in 4X4, to name only a few of the ways to have your own distinct experience with Zambia. The country also attracts adventure-centric travelers in Africa with the offerings of microlight and helicopter flights over the majestic Victoria Falls, canoeing along the Zambezi River, fishing on the river, safaris on elephants, horseback riding and many other exciting activities! Uganda is a place where you lose yourself in the wilds of Africa. The country remains a relatively low-visited safari destination, yet Uganda is home to one of the world’s most valued and threatened species that captures the hearts of humans worldwide — mountain gorillas. The number of mountain gorillas on the planet is precariously low with fewer than 1,000 remaining. Uganda is home to around half of the gorillas, and most of them are found in the Ugandan Bwindi Impenetrable Forest while the remaining gorillas are found in Mgahinga Gorilla National Park. As a UNESCO World Heritage Site, the forest is globally recognized as a safe haven for mountain gorillas, and AfricanMecca Safaris takes great pride in arranging visits for our guests to see these magnificent primates up, close and personal. Should you desire to enhance your primate experience, Uganda is also a diverse outback to see chimpanzees in the forests of Kibale, Budongo, Kalinzu and also at Semliki Valley and Kyambura Gorge. All the while you are immersed in stunning landscapes, such as Rwenzori Mountains of the Moon, ancient volcanoes, dense jungles and thriving rainforests. Complementing the scenery are the many carnivores and herbivores for which Africa is known and loved. Explore national parks such as Queen Elizabeth, Murchison Falls, Semuliki, Mount Elgon, Lake Mburo etc. Uganda is also rising to the top as a global birding destination, and the over 1000 bird species includes the rare Shoebill Stork! You visit one of the many protected areas, and even have a front row seat to the Nile River! Boating safaris are quite popular in Uganda, and these outings give guests a unique perspective of the ecology and wildlife as you see crocodiles hunting prey while elephants, zebras, buffalos, varied antelopes and other herbivores carefully drink, keeping watch for lions and other land-based hunters. For spirited guests, Uganda offers hiking trails, kayaking, white water rafting, volcano treks, rock climbing, mountain biking and so much more! Experience your very own “Gorillas in the Mist” African vacation in Rwanda! Followed a professional ranger-guide deep into the natural habitat of Rwanda’s mountain gorillas in the Volcanoes National Park (Parc National des Volcans), and you can even pay homage to those who have worked to protect the awe-inspiring creatures. Dian Fossey, the most acclaimed conservationist who worked with mountain gorillas, is buried in Rwanda. You can also meet some of the local peoples who once poached the animals, but now work to give mountain gorillas a fighting chance to survive and thrive. As Africa’s first national park alongside the bordering Virunga, Volcanoes is home to parts of the continent’s mountain gorilla population. Lake Kivu, one of Africa’s Great Lakes, gives guests a chance to refresh themselves with water-based activities, and the lake is especially noteworthy for its Congo views of Nyiragongo, an active volcano that displays a glow of magma around its rim. Rwanda also offers a terrestrial bush experience, and Akagera National Park offers iconic African wildlife viewing opportunities, such as buffaloes, elephants, hippos and other grazing fauna like topi, bushbuck, impalas, as well as crocodiles, hyenas, leopards and other carnivores. Peer into the dense foliage to catch a glimpse of golden monkeys and chimpanzees in Nyungwe Forest. The rainforest is also home to black and white colobus monkeys, and you will not believe how many of the contrasting-color creatures scamper amidst the branches. In addition to being known for its “Thousands Hills”, Rwanda also has a heavy and somewhat tragic history. Visiting the capital city of Kigali gives you the chance to visit the Kigali Memorial Centre. The country’s former unstable history is documented in the many displays and exhibits, including the genocide of more than 250,000 people who were killed in 1994. Iconic images of Namibia showcase the eerie beauty of its desert landscape. Dating back 80,000,000 years, the sandy landscape is the oldest desert on Earth. The Kalahari Desert and Namib Desert share only the designation of being deserts, as each offers a truly unique experience and varied animal species. True desert lovers appreciate the magnitude of dunes at Sossusvlei in Namib-Naukluft National Park. The immense, clear skies are absolute perfection for those seeking a remote location for star gazing and astronomy amidst a deeply secluded location. Namibia is also a place of contrasting landscapes. Vast expanses of sand dunes edge against magnificent mountains, and the arid country seems an unlikely place to find an ocean, but Namibia has a stunning coastline, especially at the Skeleton Coast. Noteworthy protected areas within Namibia are Etosha National Park, Namib Rand Private Game Reserve, Waterburg Plateau National Park and Fish River Canyon. Favorite activities amongst our guests include wildlife viewing, birdwatching and river fishing. Namibia offers a cultural fusion of the ancient Herero, Nama, Damara, San Bushman and Himba tribespeople alongside the 20th century colonial German and Portuguese migrants. 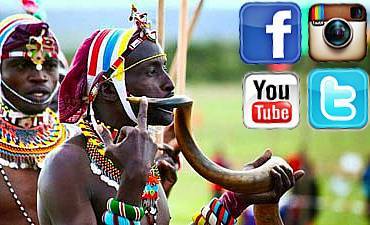 The Himba have successfully sustained their culture and traditions in our modern tainted world. You will be especially impressed with the intricacy of their jewelry. The Himba people also follow a practice of commemorating significant life events with their red ochre hairstyles. The events may be joyous, such as a wedding, or disheartening, such as the death of a paternal parent. In northeastern Namibia, the San Bushmen are ever-present, and they too have maintained a traditional lifestyle despite pressures from the outside world. The best part of Namibia, though, is that our guests benefit from the affordable characteristic of Namibia, and the array of accommodations that fit into any budget large or small. We also recommend Namibia’s Twyfelfontein Valley to rock art buffs. Zimbabwe offers something for every budget, making it a top choice for value guests who want an authentic African experience that is also affordable. Changes by the local government have stabilized the country’s infrastructure and made improvements that accommodate tourism. Local operators, though, have maintained pricing to bring in guests of every budget level. 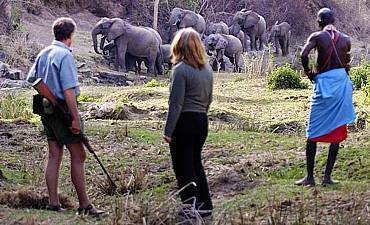 But far more than price brings thousands of visitors to Zimbabwe every year. The country is home to some incredible bush destinations where rivers meander through dense plant life, and guests truly enjoy the moderate tropical climate. Diverse national parks, from Hwange, Mana Pools, Nyanga, Matobo to Gonarezhou stand ready to lure you into their gorgeous natural beauty and diverse wildlife. Despite the magnificence of Zimbabwe’s protected areas, the country remains a little-known treasure amidst the popular sites in neighboring countries. But the absence of tourists is a windfall for our guests, as you explore the remote areas with a certain sense of isolation. Joining you are some of the best guides in Africa whose skills, insights, knowledge and experience is recognized around the world as top-notch and unparalleled, especially for walking safaris. When you travel in Zimbabwe, you feel a part of the local communities. The tribespeople of Shona and Ndebele are known for having an intense love for their homeland, and they cherish every opportunity to share it with our guests. The Big 5 and other iconic African wildlife make for exciting viewing, and Zimbabwe is also a birding paradise with its Zambezi riverine ecology. Both Hwange and Mana Pools are top sites for avian-life viewing. In Zimbabwe’s premium spot, you can also stand before the massive cascade of Victoria Falls, one of the Seven Wonders of the World. The falls are only one of the UNESCO World Heritage Sites in Zimbabwe; the others being the ruins of Great Zimbabwe. Ancient rock art sites such as Matobo Hills, Diana's Vow, Murerwa, Gwangwadza, Ngomakurira and Domboshawa appeal to even the most discerning archaeological buff while art connoisseurs will fall in love with the soapstone sculptures that are the handiwork of the Shona people. With more than 1500 miles (2500 kilometers) of pristine beaches, Mozambique is a beach lover’s paradise that is blended perfectly with seclusion, mystery and adventure. The area’s history is soaked with tales of quest, trade and explorations. Ibo Island is where Vasco da Gama refreshed during his 15th-century voyage. Pioneering pirates once sailed the waters in search of lone ships to pilfer! Today, the area offers a plethora of beach and marine experiences. The Quirimbas and Bazaruto Archipelagos offer intimate and private getaways for newlyweds and romantic couples. Marlin, sailfish, swordfish and other massive sporting fish are the catch of the day in the channels just off the Mozambique shoreline. With so much beautiful Indian Ocean surrounding the area, fresh seafood plays an important role in creating gastronomical centerpieces for fulfilling meals. The Makonde people in the northern region of the country are recognized for creating spectacular artwork that represents their history and culture. In addition to being a place of great art, Mozambique also entices music lovers who seek out a festive and unique island sound of Marrabenta, influenced by its Portuguese colonial settlers. The beaches of Mozambique are as full of character as her people. The coral reefs of Primeiras and Segundas are some of the best on earth, and the marine life is spectacular, from migratory humpback whales, manta rays, whale sharks to hundreds of rainbow colored reef fishes. Although past conservation efforts struggled to protect Mozambique’s natural resources, today you will find groundbreaking efforts to restore wildlife populations amidst a land that few visit, thanks to improved land management practices, community projects and other measures to protect the environment and animals. Gorongosa National Park and Niassa National Reserve are worthwhile wildernesses to visit in Mozambique. Travel publications often showcase the beauty of Seychelles – the Indian Ocean lands of 115 granitic and coralline islands. The sparkling water and fine sand beaches complemented by awesome formations of rock create an exceptional seaside destination. The experience is further enhanced by the tropical climate, laid-back atmosphere and complete absence of large crowds. An intriguing world below the water awaits your discovery and exploration of large, pristine coral reefs — some of the best in the world for diving and snorkeling. The splendid setting is an open invitation for sailing and other active-aquatic activities that awaken your inner adventuresome spirit. The lush green mountainous island slopes entice you to delve into their habitats while mountain biking, hiking, jeep tours and other inland pastimes. You see a veritable kaleidoscope of colored bird life, mammals, amphibians and reptiles. While the skillful assistance of your guide, you may even spot a giant Aldabra tortoise, the world’s tiniest frog species and many other small denizens that peek out from the vegetation. Spend hours and hours wandering markets and other shopping venues. Settle in for a mouthwatering meal of Creole dishes, an unexpected gastronomical indulgence. The oceanfront location makes for delicious seafood and fish cuisine that is delicately flavored with culinary inspirations from Africa, Asia and Europe. From homely, clean guest accommodations to luxury boutique resorts, Seychelles is a place where every budget brings a heavenly experience in a coastal setting unlike any other on the planet! The highlight of your Seychelles holiday, though, will certainly be island hopping! Mahe, La Digue, Praslin and smaller islets like Cerf, Fregate, Desroches, North, Denis etc, and each offers a unique, matchless and unforgettable island beach experience. No country in Africa tells a more compelling story of her people and her human history than Ethiopia. Even the blend of supreme heights of the Simien Mountains and intriguing natural depressions of reflects the human experience of Ethiopia. As you travel to Ras Dashen at 4550 meters above sea level and Danakil Depression at 125 meters below sea level, you begin to feel a deep connection to the native peoples and the influence of global cultures. The country’s active volcanoes seem to cry out like echoing voices, and Blue Nile Falls harkens you to understand that Ethiopia’s history is the momentum behind who she is today. Cultural and religious influences are found in almost every part of Ethiopia. In Lalibela, visit the 13 churches that were hand-carved from the rock of a massive mountain. The cherished Ark of the Covenant is said to be kept under lock and key at the Ethiopian Orthodox Church in Axum, the primary church of its kind in the country. Being inside the fortified walls of the ancient Islamic city of Harar or locally known as Gey takes you beyond its yesteryear trading world. It houses 82 mosques and 110 shrines dating from the 10th century. Human history unfolds in the Omo Valley, a favorite destination for anthropologists and like-minded visitors who wish to delve deeply into Ethiopia’s ancient past. The valley reveals clues of early tribal peoples who crossed the area in a migratory fashion. Today, eight tribes, from Karo, Kwegu, Hamer, Kwegu, Bodi, Daasanach, Nyangatom and Suri, still live at the lower end of the Omo River. A museum in the capital city of Addis Ababa frequently displays the oldest humanoid remains known as “Lucy” that date back 3,200,000 years. A reconstructed skeleton is on display too. The remains do travel throughout the country, but even without “Lucy” the museum is well worth your time. As you partake of the many exploratory activities in Ethiopia, you can look forward to local dishes that tempt your palate. The locals eat a dish known as “injera” for every meal. The dish is made by covering a somewhat spongy flatbread, pancake-like, with meats and spicy vegetables. Preparations of fish, lamb and chicken are served with the injera to make a hearty and satisfying meal. Engaging in this traditional culinary experience is a unique way to interact with the local peoples on a personal level.